Our professional dental Ultrasonic Cleaners and baths are suitable for any dentist surgery and have been designed for medical instrument cleaning in a demanding commercial environment. Before any medical instrument can be placed in an autoclave for sterilising, it needs to be physically clean and our machines are suitable for tattoo studios, vetinary practices, podiatrists, chiropodists and piercing studios. The most popular tank sizes for the dental and tattoo profession are 3, 6 and 9 Litre. All the ultrasonic cleaning baths are made from stainless steel and built to operate quietly in the workplace. 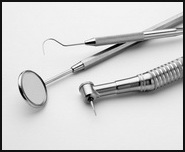 They are suitable for all day, everyday use in a dental practice and are made to last. All our ultrasonic baths are supplied complete with lid and basket. HERE is a link to the UK Government guide to HTM01-05 (decontamination in primary care dental practices)​​​​​​​. Size matters. When considering which dental or tattoo ultrasonic cleaner to buy, the primary consideration has to be the size of tank. It's not the volume that's important, but the internal dimensions. The question to consider is whether the medical instrument you need to clean will fit inside the tank and the only real way to be certain is to measure it. Also take into consideration that if you want to use a steel basket in the machine (and most dentists do), it can reduce the workable size by up to 8mm all round. The specification for each ultrasonic cleaner shows all the important dimensions. Which model do I buy? In this professional dental category, there are three versions for most sizes of ultrasonic cleaner. In summary, the more money you pay for a model, the greater control you have over the cleaning process. The "manual" (dial adjustment) have limited control. The "digital" range will give you full control over all aspects of the cleaning operation and importantly, you have an LED display showing the temperature of the water (it helps stop the operator plunging their hand into hot water and so possibly suing the employer). Finally, the degassing model can give a deeper clean. At the heart of any ultrasonic cleaner is a transducer. This is the component that produces the ultrasonic cleaning waves. The more transducers fitted to an ultrasonic bath, the better the cleaning will be. 1) Manual adjustment cleaners. These basic operation models have a simple knob or dial to set the cleaning cycle time (0-20 mins) and temperature (20 - 80 degrees C). There is no LED display. 2) Digital adjustment cleaners. These models have a push button to set the cleaning time (0-99 mins) and temperature (0 - 80 degrees C) with an LED display. The cleaning can be stopped mid-cycle and the temperature shows both the "target / set" temperature and actual water in the tank. In a workplace environment and working with hot water, there might be a health and safety implication that requires the tank temperature to be visible to prevent scalding to an employee. 3) Digital adjustment with degassing. As above but additionally these ultrasonic cleaners have the technical function of a degassing mode which, after a change a cleaning solution, quickly removes air from the liquid that in turn, makes the cleaning process more effective. Additionally, the ultrasonic cleaning power can be increased or reduced depending on the items being cleaned which means that delicate products can be cleaned gently. A basket helps minimise/reduce ultrasonic blind spots during the cleaning process. Keeps medical instruments off the base of the tank. Safe and easy removal of the items being cleaned.